As I begin my second episode reflection, I am contemplating several responses to the first. I was worried that my perspective would be too far removed from the Dariusleut viewpoint, but as one reader pointed out, anybody who listens with a careful ear to the Hutterite teachings, which all Hutterites share, should see that something doesn’t line up with the American Colony portrayal. Writing this episode’s reflection has been challenging because the show deals with a spiritual concept in a very secular manner. The central point here is the conflict of whether or not to send the Hutterite youth to the local public high school. The larger Hutterite community and ‘the elders in Canada’ do not approve, but some of the people of King Ranch Colony seem OK with it. As a result the parents who refuse to withdraw their kids from school are put in ‘Unfriedn,’ or shunned. In the meantime, the young punks in the show confirm the worst fears of the elders with their shenanigans and tomfoolery. The portrayal certainly does not help argue their case; sending them to high school in town seems to have no positive effect on their character. The episode is called “The Shunning” which reminds me of the dreadful novel series by Beverly Lewis with the same title. It has, unfortunately, the same disjointed/out of context representation of a divine process. Without giving any further background whatsoever to the biblical and traditional Anabaptist framework that undergird this discipline mechanism, it seems pretty barbaric indeed. Members of King Ranch feel that this is an unfair and unwarranted punishment because of the very real disconnect and indeed, an antagonistic relationship with their spiritual leaders. This further underscores the ‘us vs. them’ mentality I discussed in the previous reflection. At it’s most basic level, Unfriedn, which is literally ‘un-peace’ but usually translated as shunning, is a parting of ways between the church and a wayward or unrepentant member. At its best it is a mechanism by which a believer can be restored to full membership within the body of Christ. At its worst, it is a soul-crushing device that an ungodly or unwise leader can use to manipulate the people he has been charged with pastoring. Shunning can be a way of saying, “We love you, but the mandate of Christ demands that we send a strong message to you about your behaviour. We must part ways so that the purity of the church may be maintained.” In the early years of the Hutterite church, this discipline mechanism was an effective, if overused, way of dealing with unfaithfulness. However, as the church institutionalized its use became influenced by personality clashes and family feuds and it became a powerful cudgel leaders could use to corral followers. Two years ago I organized a short lecture series with a Mennonite professor of history and theology from the Canadian Mennonite University, Dr. John J. Friesen. I asked John to speak about the application of historical knowledge and its bearing on the past, present and future, which he did in his usual thorough manner. In addition to this topic, John also spoke about restoration and restitution in a church setting. He told the story of the Dutch-Mennonite leader who ended up shunning everybody in his congregation except himself and his wife—and he had questions about his wife!—because they disagreed with him. As Hutterites we have long looked down our nose at some of our Mennonite friends for abandoning the biblical practice of shunning. Because of this, it didn’t take long for somebody in the audience to ask John, “Why did the Mennonites stop using shunning?” John paused for a moment, stroked his goatee, and said gently but with emphasis, “Because it was misused we had to find better ways to deal with conflict.” When Unfriedn, as portrayed in American Colony, is misused, or viewed and exercised as a punishment, it is ineffective and certainly beyond the bounds of biblical application. A present day example of shunning in use is the schism among the Schmiedeleut in Manitoba. Here it is a means by which former brothers and sisters in Christ can indicate to each other that there is a rift that needs to be healed—a relationship that needs to be restored before we can whole-heartedly participate in a shared life of Christian service and participate together in Christian rituals such as marriage, funerals and, of course, the great symbol of Christian unity, Abendmahl, the Lord’s Supper. At this point, based on comments on this blog and elsewhere, a new question is emerging for me: What if, just what if, the portrayal of Hutterite life as seen in American Colony is a reality for some Hutterites? What if some of our friends or brothers and sisters have become divorced from our spiritual heritage? If this is the case, perhaps a different approach entirely is needed here. I think there has been a “deterioration” in the Hutterite way of life in the past decades. For the most part I believe that we have become more “lukewarm” as described in Revelations 3:16: “you are lukewarm, neither warm nor cold, I spew you from my mouth”; We tend to become more laid-back with what we accept. There is a disconnect between communities (more relevant in some than in others). It almost seems like at times we dance around issues because of how it might affect people. Some communities seem to allow everything while others allow nothing (in terms of “euer Tun und euer Lassen”). This lukewarm approach, as well as the more strict response (You did this now you have to be punished) where “Unfrieden” is used as a punishment, not as a means of guidance to repentance. I believe that it is both of these approaches, “Allow All” or “Punish All”, have led to the dysfunctional communities amoung us. The conflict of “us-vs-them” seen in this episode can be seen in many Schmiedeleut communities as well. Often times the us-vs.-them is within the community itself where the members of the community seen the colony elders as “them” and we often hear the complaint “Es wet uns nichts gegunnt”. Are we divorced from our spirituality? I do believe that the peaceful times we are experiencing are leaving us less spiritual, and in many communities, being spiritually minded is seen as “Irrglaubig”. As for the show being an awakening, watching the episodes has be thinking about how I am portraying myself as a Hutterite, are my “Tun and Lassen” speaking for me, or do they give a picture that is not fitting of a Hutterite? I find that I need to focus on how I am portraying Hutterite lifestyle, faith, and values. I cannot change what was filmed at King Colony, I cannot change what people will see on National Geographic, but maybe I can be a brighter light to the people that i come in contact with. As always, Kenny, extremely well-written and thought provoking. I really enjoy your blogs, and hope they continue to inspire me in my own work. And in response to Jesse’s comment, to paraphrase someone, ‘There are always a few bad apples.” Indeed. I like your unbiased opinion. Sure is a breath of fresh air coming from a hutterite. Thanks again. Well…another interesting entry Kenny. Hopefully only a few of your ideas are born in the wee hours…I know what that can be like! I have seen first hand the relational and psychological harm the practice of shunning can cause. I must be honest here and point out that I am opposed to the practice. In my opinion it does more harm than good. It often does not resolve core issues. It can be used as a convenient arm twisting tactic to extract obedience. Ultimately, the practice leads to an imaging of God as tribal, vengeful, Finger Shaker, Law Giver, Male. The practice does not bode well for a God of compassion and reconciliation. There has to be a better way for dealing with internal dissent. The steps for resolving conflict, attributed to Jesus in Matt 18, are worrisome because the assumption is that the Church will always reach a just verdict. I don’t think the writer ever considered the possibility that the Church would side with the erring party. History shows that it has….and then it takes many years before the Church sees its error…sigh. Shunning induces fear! The threat of punishment is a poor way for extracting spiritual obedience. Shunning is a form of relational violence that should not be happening amongst those who belong to the historic peace churches. I would never want my children to obey me because of the fear of what I and my wife might do! I never once punished my children with the rod. My wife and I reasoned with them. There were occasional “time outs”. We explained how their behavior can be harmful to more than themselves; how it can harm the whole family/community. As parents we were willing to suffer the consequences of disobedience with them. As a result both our children, now mature adults, retain a very close and loving relationship with us. And they will pass on to another generation what they learned from us…I hope. I applaud this kind of reflection! There is a constant danger that the striving for “unity” will lead to uniformity. The two are very different! The former comes and goes. It is joyfully embraced when it is felt to be there, and it is waited upon when times are dry. The latter is easily achieved and often confused with the former. It is quite possible to experience a unity of spirit while giving plenty of space for individual differences. Perhaps the greater question is how willing communitarians are to embrace diversity while keeping the focus and commitment on unity. Can there be sufficient tolerance for individual needs and differences, while retaining the focus on the common good? Hutterites are not allowed to have television or radio and do not take or have photographs. Some are severely disciplined for having these things, and the preachers continue to preach that as Hutterite practices expected to be obeyed. If that was followed there simply wouldn’t be blogs like this. What’s going on anyway? Is somebody backslidden or what? Ermle: Please read my post on the diversity of viewpoints around technology. Hutterites no longer fit into a neat little box. Ermle: Let me gently ask you this. What are you defending: a tradition properly contextualized which used to be relevant for life (with its attendant persecutions) in the 16th Century, or the free movement of Spirit in our time? You can’t have both at the same time. Spirit and tradition mix about as well as oil and water. The former is fluid and ever changing, the latter is fixed in time. Hutterites today want a faith that is contextually relevant for our time. The problem with institutionalized religion is that it erects artificial boundaries in order to keep the faithful “pure”. A person sensitive to Spirit, listens to Spirit for guidance. Yes, our Anabaptist forebears should be honored and remembered for their sacrifices, but our remembering and honoring has to occur in the modern context. Without a stake in the ongoing and emerging Hutterite story, young people will be drawn away. Kenny is an example of young Hutterites who are trusted to use the internet wisely. It’s a matter of trust and not an adherence to rules that keeps folks like Kenny in the Hutterite Fold. See what I mean? Melchior interesting that you make the comparison between spanking and shunning. I disagree that they cannot be beneficial. Both practices are scripture-based and if applied accordingly can bring about solutions to the problem. Unfortunately, both, as experience has taught us, can be misused. Shunning must be used towards willing participants or it loses its value. When forced on the unwilling the result is either hostility or confusion. The afore-mentioned Schmiedeleut split shunning is an example of this. In comparison to spanking, it is bringing about punishment towards a whole classroom of children when only one child misbehaved. Explaining to innocent children why they also deserve the same punishment is impossible. I really just started to read about this practice and I’m trying to get my head around it. However, speaking in pure generalities, God has created many ways for us to worship Him and live as He wants us to. He tells us that the secular world will not always understand them. He also tells us, that when we take these things and take God out of them and insert our own wisdom and reasoning, they become useless if not very harmful. The sad state of the modern church has become a testament to that. Bravo on the good article. It is something to think about. Look forward to more. Shunning is necessary when someone stubbornly violates scripture–as a last resort. I really don’t understand why the issue of high school should lead to shunning. Couldn’t a colony with a well-educated single woman send her to teach at King’s Colony? Or perhaps a disabled man could teach. Of course it’s foolish to send the youth to public school, but elders need to help find solutions rather than resort to shunning. I’m also baffled as to why the colony minister did not come up with a solution. With all the wonderful homeschooling resources available, no one needs to depend on worldly high schools. Barbara B. , You are right, One does not need to be in town to go to high school. Out of 22 students, only 3 have not graduated in our colony. Everything is done here in the community. I think it’s the sports issues that the ‘Elders’ frown on.Our kids went to public school for 13 years,,, never participated in any sports, and it was not a problem, Did P.E. for exercise, all was good. ( i think the school issue is the tail-end of the problem, Start from the top and go all the way down,,>where are the Colony Elders in all this??) Yes it is a hard nut to crack, but in this day and age there seems to be a solution to everything. As a Christian who has lived among Hutterites (so many years ago now), the issue of schooling is a very important one. I am a firm believer that Christians should ensure their children are taught in Christian schools (to the extent possible) and should shun public schooling. It would be an absolute last resort for a Christian family to have to send their children to a public school. Public Schools are by definition anti-Christian. I became a Christian when I was 18 attending a public school and I can tell you that as a leader of a high school Christian society, there was hostility towards Christians. Children will be faced with the world soon enough, schooling and parenting should give them the tools to prepare them. 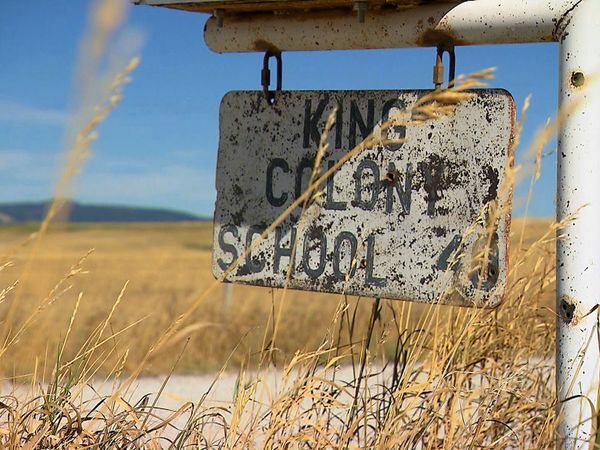 My experience and observations of schooling in Hutterite colonies, however, showed me (and perhaps it is now different) that there was not a high regard for education. The minimum requirements of provincial law were respected but there was little interest in furthering education unless one was to become a school teacher. I remember the stories I was told by Hutterites themselves that in the 16th century, they were actually leaders in education because at the time there were no schools for ordinary people who could neither read, write or count. So I think that Hutterites have lost something by not keeping their leadership role in education. It is unfortunate. I am sure Hutterites have enough numbers to have their own post-secondary institution(s) of higher learning. We forget that no only Hutterites, but other Christians were leaders in education. It was the world that had to catch up and then by subterfuge they corrupted schools once founded by Christian believers.